The game was played in Washington, D.C. 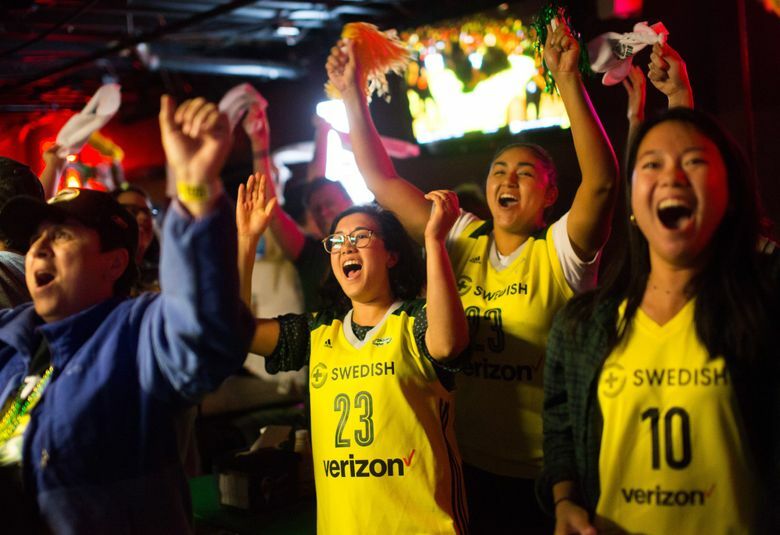 But when the Storm won the WNBA championship on Wednesday night, the party was at Ozzie's. Welcome to Ozzie’s, where white towels wave; where green and yellow balloons are tied to every railing; where the bar smells like whiskey and the TVs are tuned to ESPN2; where strangers sing “M-V-P” and refuse to stop standing. 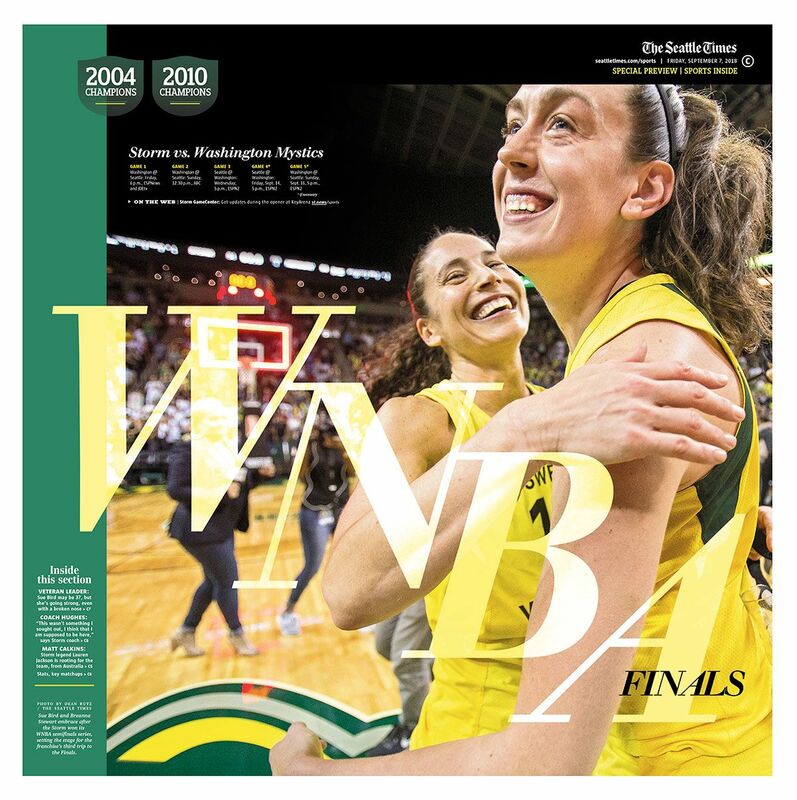 The Seattle Storm won a WNBA championship on Wednesday night. The game was played in Fairfax, Va. But the party was at Ozzie’s. 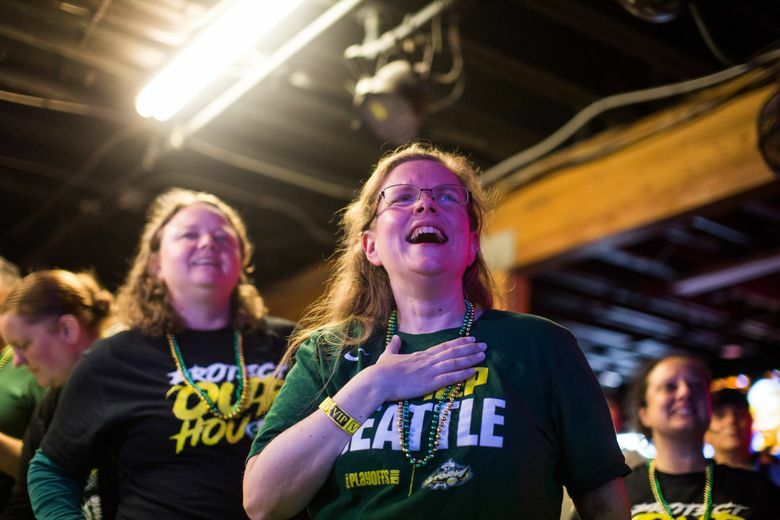 Dennis and Jill Ryan knew that; it’s why they drove for an hour from their home in Everett to the official Storm watch party at a beloved dive bar in Queen Anne. They sat across from each other at a long table with a green tablecloth, in front of a projector screen, packed together with their best friends for Game Three of the WNBA Finals. In a 98-82 series-clinching win over the Washington Mystics, the storm brewed, the beer flowed and “We are the Champions” streamed out of the speakers. 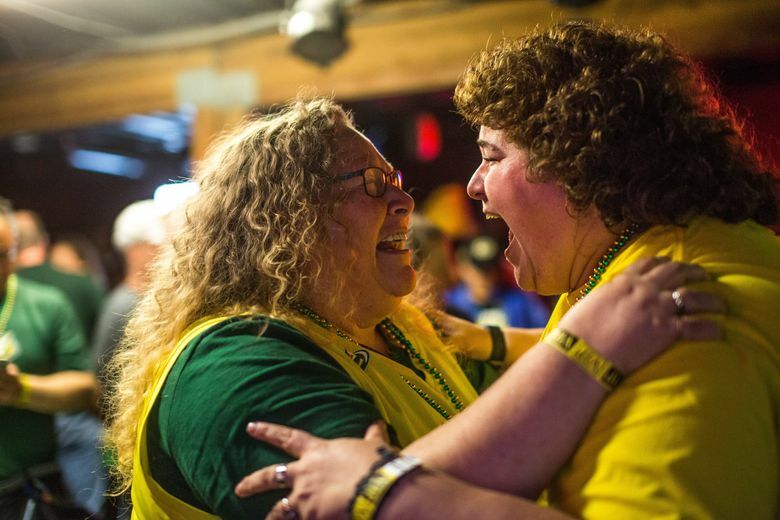 The city may have celebrated on Wednesday night, but nowhere more than Ozzie’s, where the karaoke room was transformed into a makeshift taco bar. 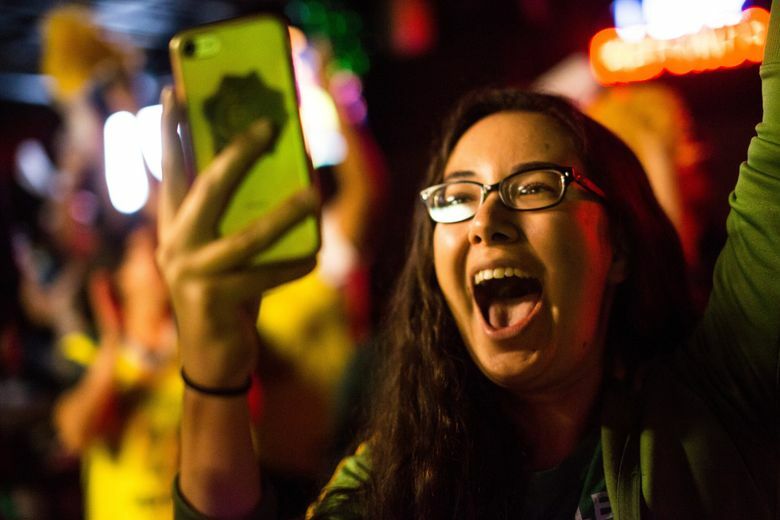 Projector screens were set up on both floors, and fans filled in between the tables, forming a pompom waving mosh pit as the Storm extended a comfortable lead. “It feels just like being at the game,” Jill Ryan said, wearing a green Storm bandanna around her neck. And, just like at the game, “De-Fense” chants rang out when the Storm needed stops. When Sue Bird’s broken nose started bleeding, one fan responded, “We love you, Sue!” With 2:35 left and Seattle clutching a 17-point lead, the crowd started chanting “Let’s go Storm!” during a Skittles commercial, just because. 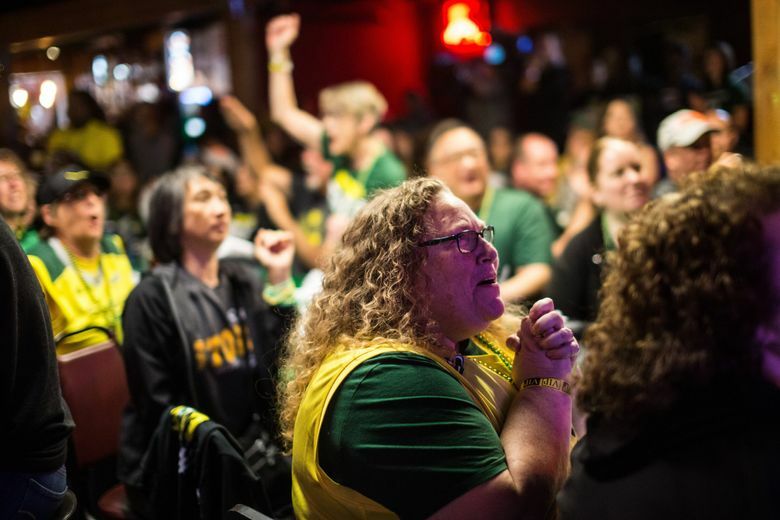 “While we don’t have season tickets, we might as well, because we roam the streets until we find a ticket and get in,” Kari Beauchamp said with a laugh, as her husband sat beside her in a decade-old Bird jersey. 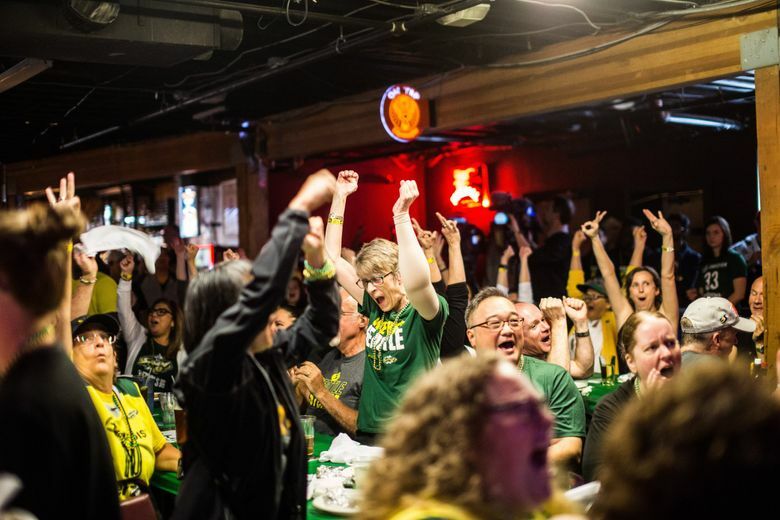 On Wednesday, at a bar a half mile away from KeyArena, all were welcome. At the end of the third quarter, a broom began being passed from table to table like a trophy. A few minutes before the score went final, a bartender passed out bottles of Wycliff champagne. 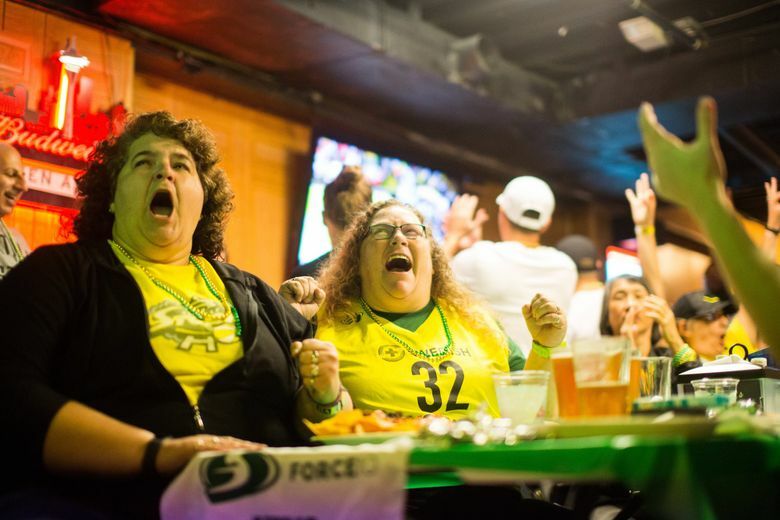 After Bird connected on a three-pointer in the fourth quarter, a woman with pink hair and a dark beer lifted her arms and openly screamed. During the second half, ESPN showed the potential schedule for Games Four and Five. “It’s not going to continue!” a fan yelled in instant rebuttal. Of course, that fan was right. When the horn blared and the Storm’s championship sweep was complete, Ozzie’s erupted in a mass of hugs and champagne toasts. A man in a yellow shirt and black hat went down the row, hugging his friends and crying. Dennis Ryan waved a white towel, then leaned over the table and kissed his wife. They watched as Storm coach Dan Hughes stood on an elevated stage and talked with ESPN reporter Holly Rowe. “I’ve got to give a shout-out to the people back in Seattle,” Hughes said. The rest of the coach’s interview was engulfed by a deafening roar. For the first time since 2010, the Storm was WNBA champions. The crowd at Ozzie’s belted out “We are the Champions” and “We Will Rock You” before exiting into the night. Eventually, reluctantly, Dennis and Jill Ryan made the hourlong drive back to Everett.